LUCA brings out the best in Betty, left, says Cydney Kaplan, right. Betty Nicholaw wasn’t in a very good mood. Turning 91 last month probably has its ups and downs. But the one-time CBS executive administrator’s spirits rose within minutes of meeting with her furry friend Luca, an 11-year-old Pomeranian. “Her personality really shines when Luca’s around,” says Cydney Kaplan, a certified recreation therapist and owner of Independent Living Concierge. The pair visit with Betty twice a week for lunch or a movie. 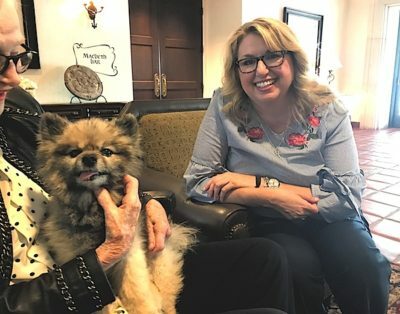 Cydney adopted Luca from Southern California Pomeranian Rescue two years ago, and she quickly saw that the plush, charcoal-grey dog was a natural for her line of work. He passed the pet therapy certification program with flying colors. “Luca likes to be petted by everyone,” says Cydney, who picks Betty and a caregiver up at Betty’s home on Rossmore Ave. The group dine at the Wilshire Country Club or Le Petit Greek on Larchmont Blvd. or they head to The Grove. Betty has shared some words of wisdom with Cydney since meeting her three years ago. The formula worked for Betty, who was married 50 years to George Nicholaw, the legendary newsman at KNX radio, a CBS subsidiary. He passed in 2014. A lifelong animal lover, Betty and George had Siamese cats and beagles, says her nephew Constantine Nicholaw. After she married, she volunteered at a Hollywood women’s shelter, he said. Suffering from Alzheimer’s, it sometimes takes Betty awhile to recognize her nephew when he visits. Not so much with Luca. Sometimes Betty even claims Luca as her own. “He won’t talk back. He’s a good listener,” says Betty, petting the dog, sitting quietly in her lap.